There is a wide range of pet food products available to meet all consumer needs and preferences. To help owners with the decision of which pet food to choose, some pet food labels include claims which may make an emphasis on certain ingredients or attributes. Whilst there may not be specific legal definitions for some of these claims, the European Pet Food Industry Federation (FEDIAF) has a set of standards for manufacturers that are written in line with general EU regulations1. Please see below some of the most common pet food claims explained. 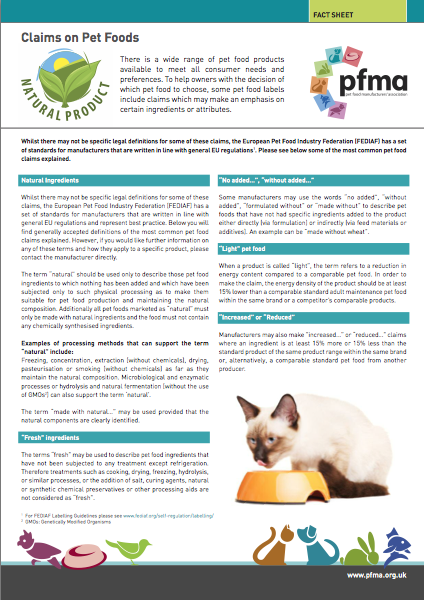 Whilst there may not be specific legal definitions for some of these claims, the European Pet Food Industry Federation (FEDIAF) has a set of standards for manufacturers that are written in line with general EU regulations and represent best practice. Below you will find generally accepted definitions of the most common pet food claims explained. However, if you would like further information on any of these terms and how they apply to a specific product, please contact the manufacturer directly. The term “natural” should be used only to describe those pet food ingredients to which nothing has been added and which have been subjected only to such physical processing as to make them suitable for pet food production and maintaining the natural composition. Additionally all pet foods marketed as “natural” must only be made with natural ingredients and the food must not contain any chemically synthesised ingredients. Freezing, concentration, extraction (without chemicals), drying, pasteurisation or smoking (without chemicals) as far as they maintain the natural composition. Microbiological and enzymatic processes or hydrolysis and natural fermentation (without the use of GMOs2) can also support the term ‘natural’. The term “made with natural…” may be used provided that the natural components are clearly identified. The terms “fresh” may be used to describe pet food ingredients that have not been subjected to any treatment except refrigeration. Therefore treatments such as cooking, drying, freezing, hydrolysis, or similar processes, or the addition of salt, curing agents, natural or synthetic chemical preservatives or other processing aids are not considered as “fresh”. Some manufacturers may use the words “no added”, “without added”, “formulated without” or “made without” to describe pet foods that have not had specific ingredients added to the product either directly (via formulation) or indirectly (via feed materials or additives). An example can be “made without wheat”. When a product is called “light”, the term refers to a reduction in energy content compared to a comparable pet food. In order to make the claim, the energy density of the product should be at least 15% lower than a comparable standard adult maintenance pet food within the same brand or a competitor’s comparable products. Manufacturers may also make ”increased…” or “reduced…” claims where an ingredient is at least 15% more or 15% less than the standard product of the same product range within the same brand or, alternatively, a comparable standard pet food from another producer. Whilst there is no legal definition for organic pet food, companies growing, processing and importing organic ingredients must be registered and approved by an organic certification body that has been approved by the Department of Environment and Rural Affairs (Defra). A pre-packed product can only be labelled as “organic” if at least 95% of the ingredients are organic3. Which pet foods are better for pets? The best way to ensure a healthy diet is to feed a complete pet food (or combination of appropriate complementary products) designed for the pet type and their life stage. After that, it comes down to consumers’ choice and preference and what works best for their pet. Always keep an eye on your pet’s appetite, energy level, stool quality and body condition, as basic signs of a healthy diet. If you are not sure, or notice any changes, speak to your vet. Some pets may have special nutritional needs, or develop one at some stage of their life, for which special diets might be available on the market. Can't all small mammals eat the same food?